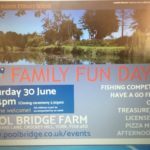 Don’t forget our Friends of Naburn Family Fun Day on Saturday! It promises to be great fun. 12-4pm at Pool Bridge Farm.